As part of the re-boot (or re-start) to our Office Re/Fresh, the team asked the Boston studio to outline their “Hopes and Fears” about the project, and, as the #1 Re/Fresh Ambassador, I have been tracking them all. My inbox is full of thoughtful comments and ideas! Lisa is outlining our Hopes+Fears brainstorming exercise for the studio. 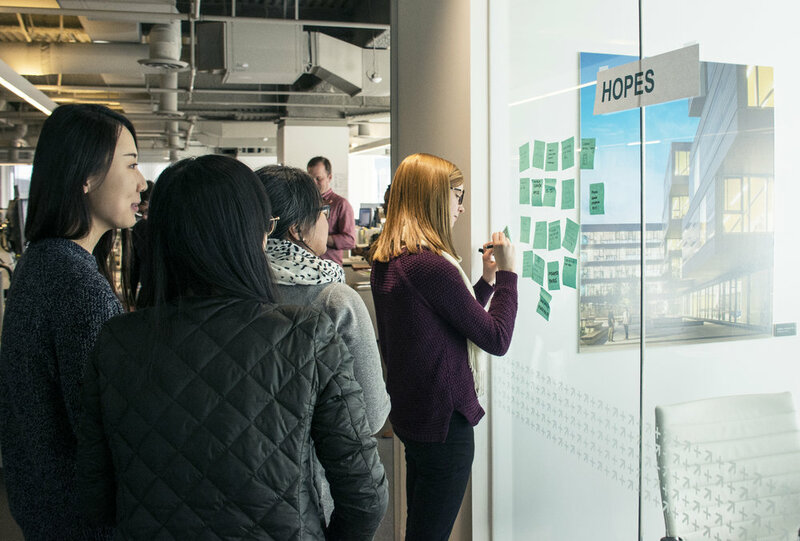 One response to our “Hopes and Fears” brainstorming exercise revealed a “hope” that this new way of working will be a fresh start and provide us with a flexible and integrated practice with better communication between teams. Fantastic, that would be a great outcome! Some “fears” touched on team members not embracing the change, and the possible lack of personal storage. I get it, most of us have lots of very important stuff! Perhaps the most telling was a fear that the project “will never happen” after the long delays in 2018. A challenge to the design team to implement a successful Re/Fresh project, and now… clocks tickin’! More Phone booths – not just one!